One of the most beautiful things about growing our company is the ability to increasingly give to others. We strongly believe in the causes below, which we support through monthly contributions & volunteering. From helping single moms, at-risk kids and teens, and providing counseling for couples, Sheridan House is committed to our community. SH gives children and families the opportunity to reach their full, God-given potential; opportunities that might otherwise not be available due to impeding circumstances in the home. Values: The staff at SH is committed to a faith in Jesus Christ. They believe that the principles for living are revealed by God through Christ and the Holy Scriptures. They train parents on how to lead their families in a godly way; to do marriage according to God’s plan and to raise up children to take responsibility for themselves and to be tomorrow’s leaders – not followers. Many vets face challenges transitioning from active duty. Too many of them find themselves homeless, jobless, or unable to access treatment for physical or mental health issues. As a veteran-owned business, we are proud to sponsor & help organizations which help our veterans. The HOW Foundation of South Florida advocates and provides financial support for veterans suffering from PTSD and gives them access to hyperbaric oxygen therapy. Omega Delta Sigma National Veterans Fraternity – Transitioning from active duty to an academic lifestyle can be difficult. ODS provides a strong network of service members on campus, giving you support and helping you stay the course in getting a higher education. 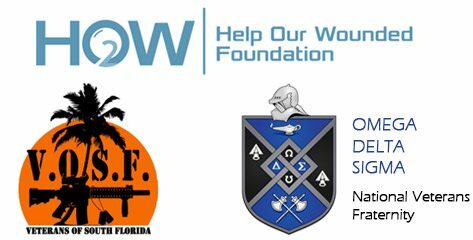 Veterans of South Florida (VOSF) is a non-profit organization comprised of veterans in the South Florida area. It is the largest social network of veterans in Florida. Their goal is simple: Help and be there for each other. From the most tender young age we all experience hurt, betrayal, or offense through relationship with someone we loved or expected more from. These wounds, whether intentional or unintentional, immediately make an imprint in our thoughts and feelings, and influence our behavior.